The Internet has given shoppers the upper hand. You can find better prices than ever, buy what you need without leaving home—any time of the day or night—and read dozens of reviews by other buyers. We believe in user reviews, too. That’s why we survey thousands of our expert readers every year about the tools they own, and tabulate that into a rating on almost every product in this guide. But individual users can only get you so far. 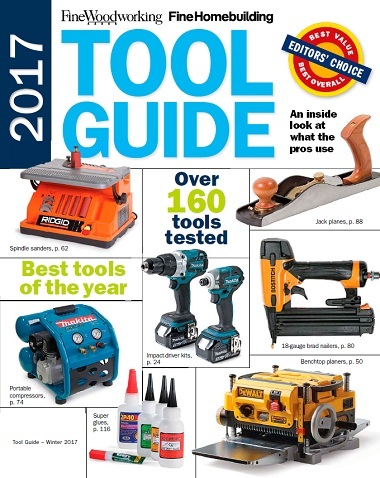 What makes this annual Tool Guide special is the head-to-head tool tests. Even the most dedicated users can’t do that. And our tool testers aren’t just any users. The tool reviews in this guide are unlike anything else available. They are culled from the pages of Fine Woodworking and Fine Homebuilding magazines, which conduct the toughest tests out there. Our expert, hand-picked writers range from professional contractors who use the tools on real job sites to passionate woodworkers who do the same in the shop. We understand what DIYers need, too. These real-world tests are designed to produce data that can be measured and compared, such as power, run time, and accuracy. If you plan to buy a tool this year for woodworking, carpentry, construction, remodeling, or all-around home use, the 2017 Tool Guide will pay you back many times over. The right tool makes all the difference, and we have the real story.